The prestigious financial magazine, Institutional Investor has once again honored The Westin Chosun Seoul on its 26th annual ranking of the "Top 100 Hotels of the World" for the third time. The only hotel in Korea to be selected on this exclusive list, The Westin Chosun Seoul also had 2 previous rankings in 1999 and 2002. Published in the U.S., Institutional Investor Magazine has covered the exciting and fast-paced world of business and finance for nearly 40 years. With their excellent industry research and ratings, professionals can easily stay on top of hot industry trends and competitive markets. 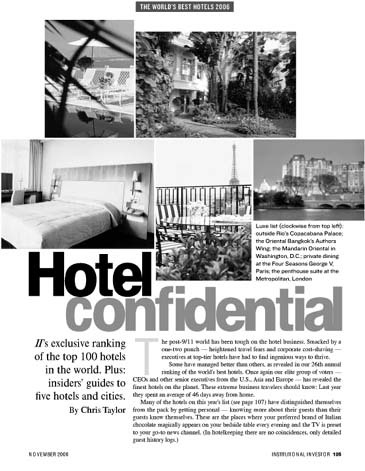 Since 1981, Institutional Investor Magazine has also annually ranked the top 100 hotels from around the world. The results of the exclusive ranking are from extensive surveys by CEOs and other senior executives throughout the U.S., Asia, and Europe. The world-class hotels on the list have distinguished themselves with top-quality services and luxuries, and The Westin Chosun Seoul is no exception. Our newly renovated guest rooms had been furnished with exceptional amenities to provide more superior guest experience. Excellently refurbished with anti-allergy carpets, each room features a premium espresso coffee maker with 4 complimentary flavors of espresso blends (2 capsules each), mobile phone free of rental charge, and a 32 Inch Flat Screen LCD TV. A 42 Inch Flat Screen LCD TV is specially featured in our luxurious suites. A sophisticated Digital TV Information Service in each room also allows guests access to our entire hotel directory. By simply using the remote control, guests can search for room service, concierge service, flight booking, local attractions, and even check-out from the comforts of their room. In addition, international news, documentaries, sports and movies are available from 50 different channels, the greatest number available from hotels in Korea, and choose from English, Japanese or eight other languages. The Westin Chosun Seoul offers guests the leisurely comforts of home combined with stellar business support, and it can all begin with our Express Check-In Service. Upon request, guests can enjoy a relaxing limousine transit to the hotel with soothing amenities and receive an escorted check-in. We continually stay one step ahead of our guests' needs and our exceptional personalized service ensure the utmost comfort, convenience and business efficiency throughout their visit, making us the most preferred hotel in Korea year after year. Taking great pride in being selected as one of the top hotels in the world by Institutional Investor, we will continue to lead in the hospitality industry with greater passion, dedication and innovation.